If you enjoy a good, consistent cup of espresso that doesn’t take twenty minutes to make nor the talent of a professional barista, then you’re going to be very happy with the Krups XP5280 espresso machine. You can make a variety of espresso based beverages quickly and easily, and the clean-up is just as fast. I have long been a fan of espresso-based drinks, but making them at home can prove a challenge. Cheaper machines tend to be difficult to use, difficult to clean, and generally give you a mediocre beverage. The challenge is finding a machine that gives you the coffee you want, but without completely breaking the bank, and the Krups XP5280 delivers. It’s pretty much ready to use out of the box. You just need to wash the accessories and then prime the pump by cycling it through a few times and you’re ready to brew some espresso. Turning it on first thing, it doesn’t take long to heat up. In the time it takes to measure out a scoop of espresso and load it into the filter holder, the unit is ready to brew. It’s simple to see because the on/off light flashes while it’s preheating and the one-cup and two-cup lights light up when it’s ready. The unit has a water tank that you access by lifting a little lid on the top and pulling it straight up, and there’s a scoop that sits in a little pod next to it for convenient storage. One scoop generally did the trick for my drinks, but you can always add more or less to change the strength of your drink. It is also compatible with soft pods instead of loose grounds. Here’s where you’d normally have to tamp down the grounds, hoping you get them just right so that the water still flows correctly through the machine and your drink is perfect, but there’s no tamping with the Krups XP5280. Instead, as you lock the filter holder into place it self-tamps. Using what they call the Krups Precise Tamp system, as you turn the filter holder the grounds are automatically tamped. You just turn until you feel a bit of resistance and then stop. It’s easy to feel when it’s snug, so if you’re brewing with more or less grounds you simply turn until you feel the resistance and you know it’s good. Brewing is easy with just a single button to push for either one or two cups of espresso. It brews a quick 1.7 oz drink with very little time inbetween cups and is programmable so you can adjust the amount to your tastes. The strength of the coffee and the amount of coffee was also very consistent so it was easy to get my perfect cup every time. If you want to make lattés or cappuccinos then there’s a steamer nozzle that swings out from the side of the machine. You simply push the steam button after you’ve made your drink, wait briefly and it’s ready to go. I am not generally good at getting perfectly frothed milk from espresso machines and often end up making it just warm milk, but it worked beautifully for me on the Krups XP5280. It was very easy to use, and easy to clean, which is often the worst part of making your own cappuccino. There is an auto-frother attachment with a switch that flips to cappucino or latté to adjust the milk-to-froth ration, but I honestly found this a little tricky. I had much better results using it without this little attachment, which is now just sitting unused in my kitchen drawer. To clean the nozzle you just do the same thing as frothing milk, but with a container of water. Even the filter is easy to clean with an eject button that pops the grounds right out. The small footprint, stainless steel finish, auto-tamping and easy to use and clean steamer were all pluses. I’ve been using this multiple times a day and have actually passed by our local coffee shop knowing I can make my own perfect cup at home. 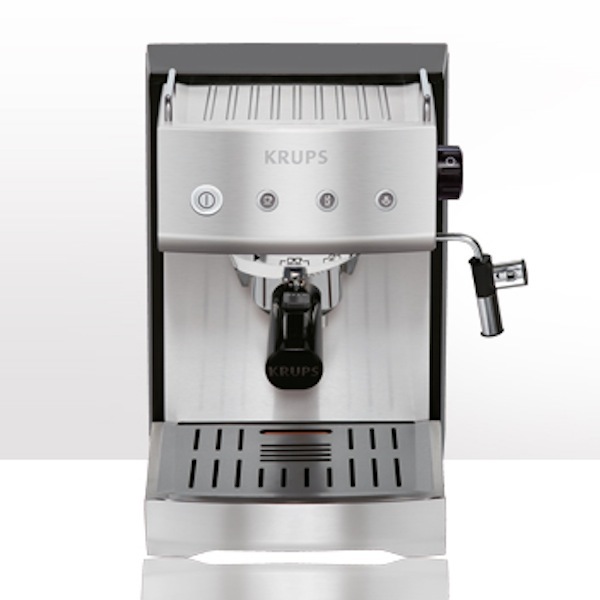 The Krups XP5280 Pump Espresso Machine retails for $299 and is worth the price. If you’re looking for a quick, consistent espresso beverage that you can easily make in your own home, then this is an excellent choice.